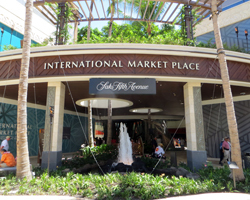 The International Marketplace: a modern new mall in place of an old landmark. The International Marketplace: It's New! 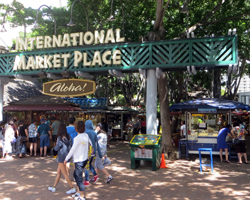 My point is, that if you’re old enough to remember the classic Waikiki of Don the Beachcomber and Duke Kahanamoku (like my parents), or if you’re old enough to have heard the stories about those glamour days (like me), this is no longer that same International Marketplace. 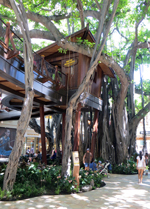 The famous Waikiki landmark that used to feature international shopping “villages”, a tree house bar, every possible Hawaii-themed souvenir knickknack under the sun, tiki décor, and even a “talking” myna bird (at one time) was permanently closed for demolition and renovation at the end of 2013. Now the International Marketplace has finally reopened, and it’s – sigh – a mall. Almost nothing stayed the same except for the name. 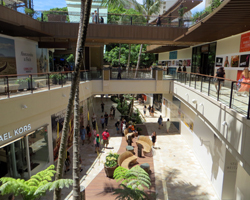 But, hey… nothing says: “I’m on Hawaii vacation” like shopping at Saks Fifth Avenue. Am I right? So if you don’t have shopping malls where you’re from, we’ve got you covered. Obviously, I miss some of the charm of the old place; and I’m a dude, so I don’t really like any shopping malls. Therefore, my opinion is definitely slanted from the start. With this in mind, I brought my wife along to check out the grand re-opening in August 2016. She liked it just fine (because she likes malls). My wife didn’t volunteer to write-up this review, though, so you’re still stuck with my perspective. The International Marketplace is very clean, new, and nicely laid-out. For non-shoppers (like me), there are tons of shady places to sit down and wait for your mall-loving counterpart to finish shopping. This would actually be a very comfortable place to hang-out on a cool evening and enjoy the free Waikiki entertainment. 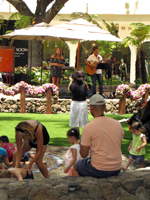 There‘s plenty of validated parking; and it’s an easy walk from most everywhere in Waikiki. The grassy courtyard features a sidewalk fountain where the kids can play. They haven’t thrown out all of the nostalgia of the past. There’s still a tree house containing a brief history of what used to be. It’s not the same. But it’s a nod to the predecessors. I didn’t include this last point in the list because some will think it’s good and others will say it’s bad. 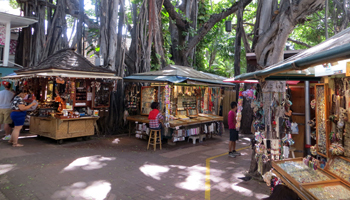 There are no more of those souvenir kiosks surrounding the base of the banyan tree. Personally, I was really hoping to see at least some, but they seem to be gone forever. I used to really like the International Marketplace specifically because it was not a shopping mall! The way I see it, 95 percent of the stores in every mall everywhere sell exactly the same products that I can purchase at my local mall for approximately the same price. And I don’t like shopping from the get-go. So the prospect of spending my hard-earned vacation time and money out doing something I could just as easily avoid at home… well, let’s just say my travel itinerary always ends up being one day too short for the mall. Meanwhile, I love local knick-knack souvenir shopping in one-of-a-kind, owner/operator, mom-and-pop boutique-type stores that usually line a few blocks of Main Street in Everytown, USA. If I go somewhere on vacation, it’s because I want to experience what they’ve got there! I want to eat their food – not at some chain restaurant we have back home. And I want to shop for products that I can’t find anywhere but there! That’s what I used to appreciate about the International Marketplace. It was as uniquely Hawaiian as anything gets. It wasn’t “authentic” Hawaiian, but it was just a fun place to look around; and it was great for picking-up your Hawaii vacation souvenirs! This is no longer a place for cheap trinkets, and part of me thinks that’s sad regardless of how much newer and nicer things are now. 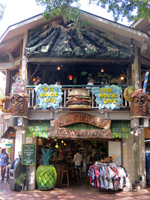 So if you need a miniature tiki, a hula girl dash ornament, a T-shirt, shell necklace, fancy candle, silk lei, magnet, postcard, surfboard clock, or any other kind of Hawaii souvenir, you’re probably going to have to go find it elsewhere. But if you’re in the market for fine leather made in Detroit or fashions from New York, well, this is your place. Ironic, right? 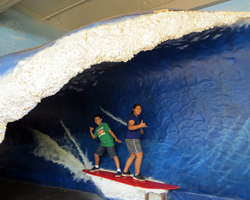 Finally, I was really hoping they would somehow retain the giant surfboard/wave photo backdrop; and I’m sorry to report that it’s gone. There was a time when every Hawaii vacation photo album featured a classic photo (either drunk or sober) of everybody piled on a surfboard and riding a giant tube. I’m just glad I was able to get one such photo of my kids before the old International Marketplace closed. As they say in our shiny new French fashion boutiques: “c’est la vie”. Time changes everything.